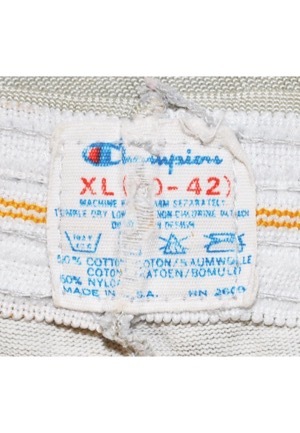 Inside on the rear waistband is a "Champion" size "XL (40-42)" manufacturer's tag with washing instructions. On the left thigh area is the player number "22" and a "PHOENIX" Suns logo below in orange. 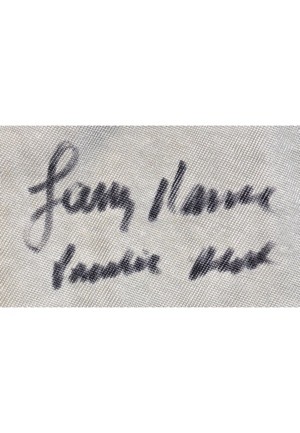 Larry Nance signed above this logo in black pen with the added inscription, "Practice Used" and in our opinion rates a 7 overall. These shorts are properly tagged, were presented to us as player-worn and in our opinion show appropriate wear. Accompanied by an LOA from JSA.